Owen Wilson and Rachel McAdams in Midnight in Paris (2011). Midnight in Paris opened this year’s Cannes film festival to mixed reviews – those chilly reviews, now an annual ritual coinciding with the opening of Allen’s latest project. Though, in essence, it’s a reality tantamount to a non-event to Allen himself, the man being his own sharpest critic. Self-flagellation aside, Allen is at a place, not only in his career, but in film’s larger historical canon, where critical reviews are moot: rising and fading with the tides. When Allen broke into the filmgoers’ collective consciousness, in the late ’60s-early ’70s, it was as a smarmy, know-it-all New Yorker known as much for his physical (and sexual) humour, as for his obsessions with love, death, and the beloved pointlessness of it all. It seems laughable now, but because of his early slapstick-like style, there was an actual debate amongst movie fans as to whose films mattered more: Woody Allen or Mel Brooks. Equally laughable are the reviews of decades past. Routinely vilified for his “attempts” to mature as a filmmaker after the blistering success of such on-the-nose comedic, ’70s affairs as Bananas, Sleeper, and Love and Death (not too mention his only true blockbuster hit, Annie Hall), Allen’s 1980s/Mia Farrow period is now largely considered to contain the bulk of his finest films. The list includes Zelig, Broadway Danny Rose, The Purple Rose of Cairo, Radio Days, Hannah and Her Sisters, and Crimes and Misdemeanors. While no one is predicting Midnight in Paris will join this company, it is worth noting that each decade of Allen’s career is considered worse than the one before, until a further decade reveals more than a few gems tucked neatly within the pack (1997’s Deconstructing Harry is as good, in my humble opinion, as anything he has ever produced). Midnight in Paris is among a handful of Allen’s films where someone else has been cast in what typically would be considered the “Woody Allen part”. Owen Wilson, with his dimples and Southern aw-shucks charm, seems as good a choice as any. Where will Wilson rank among the few who have had the opportunity to make their own mark on a Woody Allen film, in the Woody Allen part? John Cusack, Bullets Over Broadway (1994) – In another rarity, Allen co-wrote the script for Bullets with fellow writer Douglas McGrath. Perhaps feeling he may have been a little long in the tooth to play the role of a young playwright trying to discover the artist inside of himself despite gangsters financing (and casting) his latest opus, Allen cast John Cusack. Cusack is excellent amongst a great ensemble cast that includes Chazz Palminteri, Mary-Louise Parker, Jennifer Tilly, and Academy Award winner, Dianne Wiest. 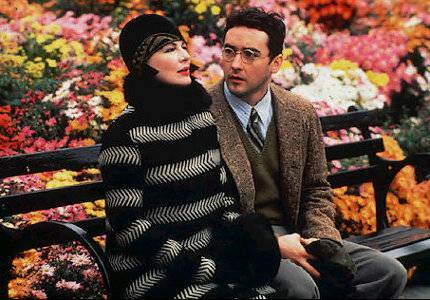 Dianne Wiest and John Cusack in Bullets Over Broadway (1994). Kenneth Branagh, Celebrity (1998) – This on is notable for perhaps being the single most reviled performance by any actor in any Woody Allen film. There was great optimism when it was originally announced that Hamlet himself, Kenneth Branagh would take the lead in Celebrity. When Branagh played the role of journalist Lee Simon as if he were actually channeling Allen himself, critics and audiences thrashed the movie unabashedly. It should be noted, there seems a current renaissance regarding Celebrity, with several critics, including Andrew Pulver of The Guardian now hailing the film as a successful achievement. Kenneth Branagh and Charlize Theron in Celebrity (1998). Larry David, Whatever Works (2009) – Twenty years after casting Larry David in a small role as a theatre manager in his short film contribution “Oedipus Wrecks” for New York Stories, Allen gives the Curb Your Enthusiasm/Seinfeld creator top billing in a role that perhaps Allen did not want to be too closely associated with. David plays Boris, a suicidal, part-time chess instructor and full-time malcontent, who unwittingly takes in a Mississippi runaway who begins to bring out his sunnier side, at least, for a while. 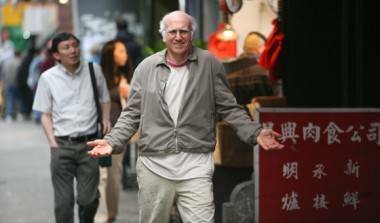 Larry David in Whatever Works (2009). This entry was posted in Homepage Features, lists and tagged Midnight in Paris, Movies and TV, trailers, Woody Allen. Bookmark the permalink.